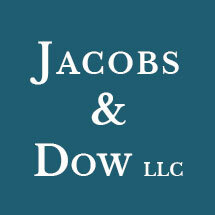 Jacobs & Dow, LLC is a New Haven, CT law firm with a tradition rooted in the representation of people. We have a proud history of helping people recover damages for all types of personal injuries, for medical malpractice, and defending individuals against misdemeanor and felony criminal charges. Our attorneys also represent individuals and businesses in resolution of a broad range of business disputes, through negotiation, litigation and trial. Our lawyers practice in the state and federal courts of Connecticut, and serve almost all Connecticut communities. Regardless of your legal problem, we have the experience and resources needed to help you towards a successful resolution. If you would like to discuss your case, please contact the law office of Jacobs & Dow LLC today. At Jacobs & Dow, LLC our commitment to you is to provide the advice, information and advocacy you need, and the care and personal attention you deserve. We value our role as your trusted advisors. We do our best to communicate effectively with you. We want you to know what is going on with your case, and why. Our goal is to help you make informed and intelligent decisions on the legal problems you entrust to us. Most client-lawyer relationships at our firm are one-on-one. "Your lawyer" will frequently consult with other lawyers here on specific aspects of your case, to get whatever additional advice he or she needs to accomplish our goal - to give you the very best advice we can. When your case is over, we want you to know that you were well represented. We want you to know Jacobs & Dow, LLC is your source for careful, caring advocacy - the same service we have provided to our clientele for the last half century. The Council for Tobacco Research - U.S.A., Inc.
Mohawk Mountain Ski Area, Inc.